Today, my family decided to take a trip to the zoo. However, I was feeling entirely exhausted so I decided to opt out. Instead of going to gawk at animals, I stayed home and watched Star Trek with my dad. Am I sounding like a nerd yet? Don't worry, it gets better. Or worse -- whichever the case may be. After Star Trek (Deep Space Nine), I decided to paint my nails. This is a rare occurrence, partly because I don't have the time and also because I dislike the smell (and, I should mention, my family dislikes it too). A couple of days ago I picked up some nail polish during my family's once-a-year trip to Target. Up until now I'd only owned nail polish in shades of pink and purple. However, my whim on this day was to select a lovely hue of sky blue and also a nice-looking shade of lime green. Just so you all know, this lime green nail polish is a lot uglier than I thought it would be. It's going to have to grow on me. So after I had painted all the fingers one one of my hands (and also tried to type with said hand, a venture which was somewhat successful), I decided to watch something. I briefly considered Star Trek, but decided I wanted to make a foray into a completely new show. The new show I selected just happened to be Doctor Who. From the beginning, I had a strange fascination with the show. Okay, okay, at first I thought the beginning was weird -- but you can't deny that a blue police box careening out of control is a little strange. As the show progressed, there was barely a second where I was bored. (This is a major feat, considering I tend to zone out with anything of a televised nature.) Mediocre plots and obvious plot twists do not phase me. Well, they do phase me, but not for the good. To grab my attention, you must have an absolutely brilliant show. I'm not 100% certain about the rest of the series, but the episode I watched was an absolutely brilliant show. I think I'd watch it just on account of the dry, British humor. From the very beginning, I was laughing out loud. I had to keep a notepad open on my computer to scribble down random quotes that tickled my fancy. And for the entire opening of the show, I was so transfixed that I had to pause it to finish painting the nails on my other hand. As for the rest of it, I'm a bit concerned that it may be too intense or creepy. 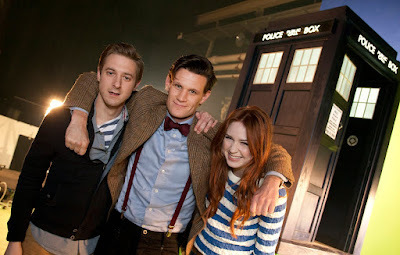 (Even The Eleventh Hour was creepy, but the brilliance outweighed the bad, I think.) So I'll have to take it one episode at a time. But for an hour's worth of diversion, I think Doctor Who was worth it -- and far surpassed any expectations I ever had. I once saw a lady with TARDIS earrings at a movie theater. I didn't understand what was so cool about them then. Now I do. The TARDIS is amazing. The end. "20 minutes to save the world, and I've got a post office. And it's shut!" The Doctor: "It's your bedroom." Ah, really? I didn't know you liked it too, that's awesome! See, that's the thing... I probably should have started with David Tennant or even Christopher Eccleston, but I didn't. The main reason was, I had already endeared myself to the Season 5 characters, so I was too excited to see them to watch the other seasons first. :P I had also been told that Season 5 was a good place to jump in, since it's kind of a "blank slate" when it comes to the entire series of Doctor Who. Still, I think I'll have to backtrack and watch the other seasons after I've finished seasons 5 & 6. I started with Christopher Eccleston (and fell in love with his smile) and since then I've moved to David Tennant, who honestly, is probably going to be my favorite doctor. <3 Originally I wasn't looking forward to Matt Smith but more and more lately I've been seeing different things that actually get me excited to see him. I think David Tennant will always be my favorite though. I don't know much about Christopher Eccleston at all. I know a little about David Tennant, and the most about Matt Smith. I think you will like Matt Smith -- he's hilarious, and reminds me of a lot of the witty writing style that you, Georgie, and I employ from time to time. I think watching the old ones would be wonderful too. Patrick Troughton was Sam Troughton's grandfather? That is so cool! I looked it up last night after receiving your comment, and found out some cool tidbits -- Patrick was the first person to portray Robin Hood on screen, and years later, his grandson played Much. Epic, eh? YES!!!! I am so glad you started watching this!!! It's an amazing show, and you'll love every second of it :) I'm actually getting ready to start watching the second series with Matt Smith in it. And you definitely need to go back and watch David Tennant's series (I'm assuming you haven't) they are by far amazing. But I will say Matt Smith is growing on me a lot. He is pretty darn amazing. Hey there! *waves* I'm having a conversation with you on Twitter right now, actually, hehe. I'm glad you are happy that I'm watching it -- that, consequently, makes me happy! I think I'll like David Tennant, too. I would have jumped in during his seasons, but I wasn't sure if it would be too confusing to jump in when his companion, Rose, was already so established. *giggles* You don't even want to know the last Doctor I saw... If I had time for TV I would probably pick Dr. Who up... from the begining if I could (I know a lot of shows right?) But, as TV doens't fit in with my life at the moment. I must just listen and be envious of those of you who have the time for such good shows..
Oh and I can totlaly imagine spending the day watching Star Trek with my Dad... But sky blue or neon green nail polish, yikes. You brave girl! *laughs* The funny and wonderful part about Doctor Who is that it's been such a long-running show. I'll admit to being curious as to which doctor you were acquainted with, though! ;) I think I'll have to go back and watch some of the past doctors as well, when I can find the time. DOCTOR WHOOOOOO!!! I LOVE this show - and that's saying something, I'm picky. It can get a little scary at times but, trust me, it's absolutely incredible. I'd recommend checking out older Doctors too, like Tennant and Ecclestone, because it's really fun seeing how different people handle the bundle of madness that is the character of the Doctor. I'm picky about shows too. I was surprised I liked my first episode of Doctor Who as much as I did! It is incredible, and I agree -- I'd love to see other's portrayals of the Doctor. I'm curious as to how they can put their own spin on the character while still maintaining the continuity from previous shows. It's an amazing feat, I'll say that much. :D Live long and prosper to you as well. B-) You're a Trekkie too? Marvelous. What club? The Whovian club. We'll have you spouting Whovian, quoting the episodes, arguing over favorite doctors, and wearing TARDIS scarves (yes, I have one). YES WE WILL.